Signed into law on December 10, 2015, the Every Student Succeeds Act (ESSA) presents education leaders with a unique opportunity to expand the definition of student success. Compared to the No Child Left Behind (NCLB) Act, ESSA empowers states to make more of the critical decisions related to accountability, school improvement, education spending, and public reporting. Although regulations to guide the new law’s implementation are still being finalized, ESSA clearly requires states to broaden the concept of school quality and student success to include factors beyond test scores and graduation rates, suggesting that education systems need to take a more holistic approach to preparing students for college and career. Based on the existing research, we believe that MESH should be a significant part of defining, assessing, and supporting student success. We do not believe that MESH measures are ready to be included as a formal part of school accountability. However, we do believe that education leaders have a responsibility to prioritize and begin gathering data on MESH. These data can be used to identify promising practices to develop students’ MESH and to target supports to schools and groups of students with the greatest need. Start measuring MESH: States and LEAs should begin routinely collecting MESH data to empower educators to have more data-driven conversations about students’ MESH development and to learn more about which instructional strategies and approaches are most effective in supporting MESH development. Use MESH data for formative purposes, while continuing to explore other potential uses for future years: We recommend that leaders gather and examine several years’ worth of data before deciding whether to incorporate MESH into a formal accountability system. In the meantime, states and LEAs should capitalize on ESSA’s flexibility and use MESH measures within needs assessments to target specific supports and interventions for struggling schools. Leverage new and existing funding to support effective approaches: States should make use of new funding opportunities, particularly the “Safe and Healthy Student” block grants within ESSA, and existing funding opportunities under Title I and Title II of the law to support effective approaches that develop students’ MESH. 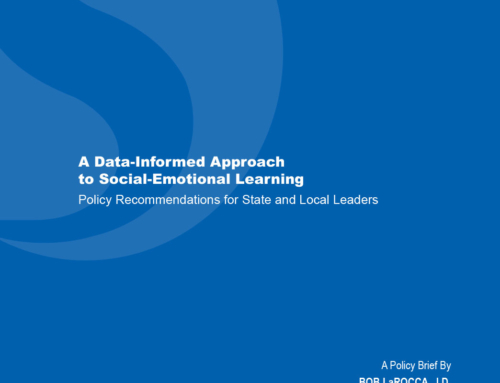 This policy brief describes our three recommendations in greater detail and outlines how these recommendations align with the provisions of ESSA. It also provides an example of one school system—the CORE Districts—that has already begun to act on these recommendations to advance students’ development of the mindsets, essential skills, and habits that support college and career success. For more information on our work, and to learn more about validity and reliability of MESH measures, please see the CORE Case Study and Measuring MESH. To read the executive summary, please visit this page.